Can Syracuse pull off yet another road win? The regular season is quickly winding down for the Syracuse Orange, as they enter the hardest slate of the season with these final seven games; the first matchup is on the road against the struggling North Carolina State Wolfpack. Yes, NC State is struggling of late, as it has lost three of its last four games, but the Wolfpack were ranked just two weeks ago and pose a huge threat towards the Orange. Syracuse needs to grab a couple more marquee wins to secure a spot in the big dance and a win on Wednesday will move the Orange one step closer to dancing in March. Here are five things to watch from tonight’s game in Raleigh. How lethal can Buddy Boeheim be? 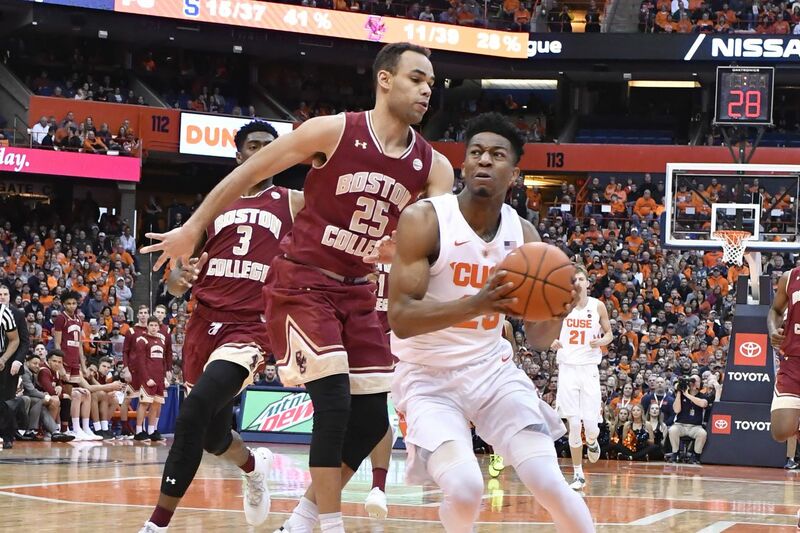 Tyus Battle may have been the team’s leading scorer in Syracuse’s last game (21 points), but Buddy Boeheim was the main story for the Orange as he dominated Boston College with 16 points, as the marksman couldn’t miss from deep. Boeheim has adjusted nicely to the speed of the game in the ACC and that has allowed him to find open spots on the floor where he can torch teams with his stroke from deep. What’s up with Elijah Hughes? Hughes had just seven shot attempts on Saturday which gave him seven points and the Orange were still able to come away with the win. He’s seen his scoring average come down recently, contrary to his consistent play in the early season. The Orange need Hughes to be aggressive on the offensive end if they are going to escape this seven-game stretch with a NCAA Tournament berth. He’s excellent at spacing the floor, but he is also great at finding the right lanes to cut through, which opens up easy shots — look for the transfer forward to come out more aggressive Wednesday night. The Wolfpack come in as the fourth best rebounding team in the ACC with 42.3 rebounds per game; Syracuse sits at eighth in the conference with 39.6 rebounds per game. Syracuse is going to need to make sure they limit NC State to just one shot per possession if they are going to come out of PNC Arena with the win. We’re relying on you, Paschal Chukwu. NC State has a balanced scoring attack with five players averaging 9.5 points or higher. They are led by Torin Dorn who averages 13.6 points (a team high) and 6.6 rebounds (a team high) per game. Dorn is a big guard at 6-foot-5, so it’ll be important for the top of the zone to limit his ability to get the ball inside. This will need to be a team effort from the Syracuse zone, and it starts with slowing down Dorn’s production Wednesday night. Can Frank Howard get back on track? As Frank Howard seemed to be getting back to the consistent player we know he can be, the senior point guard returned to playing like he was when he first came back from injury. Howard has struggled the last two games, scoring just three combined points on 1-11 shooting. Syracuse needs the aggressive version of Howard they saw during the end of January if they are going to come away with a much-needed road ACC win. We know Jim Boeheim isn’t going away from his senior guard, so he’ll have to be consistent for Syracuse to play to its potential.